One of the oldest historic sites in Safed, the cave of Shem and Ever was used as far back as the Byzantine period if not further. From the 4th century CE (Common Era), it was used as a burial cave by a prominent Jewish family of the time. It is believed that it was also the burial place of several Talmudic sages including Rabbi Dosa Ben Harkinas. However, there lots of other stories and legends surrounding this site, some of which are more believable than others. Legend has it that Noah's son Shem and his great-grandson Ever, set up a Beit Midrash or House of Study in this cave. Depending on which story you believe, Avraham, Isaac or Jacob, or two or all three of them, went at separate times, to this cave to study Torah with these descendants of Noah. Many believe that it was Jacob who should be most associated with this cave, as there are both Christian and Moslem legends pertaining to him and the cave. According to Moslem tradition, this cave is where Jacob went to mourn the presumed death of Joseph, and the Arabic name for the cave means House of Sorrow. 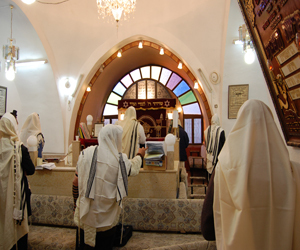 In Christian tradition the Cave of Shem and Ever is believed to be the burial place for Tuvia in the Apocrypha. During the Crusader period the cave was run by an order of nuns called The Daughters of Jacob since it was considered a holy site. Perhaps this is why the Arabic name of the cave became Awlad Ya'acob (Children of Jacob in Arabic) and this is the name it was known by Chaim Vital, the disciple of the Ari, in the 17th century. In the Mameluke period the Governor of Safed, Bachtamur el Juchandar, had the cave enlarged and refurbished, and it was used by Muslims worshipers. From then on Jews were generally prevented from praying there, except in exceptional circumstances. One such exception was when Sir Moses and Lady Judith Montefiore visited Safed in 1839 as part of their tour of Israel. They were given permission to enter the cave and Lady Montefiore compared it to the catacombs used to bury members of the Sanhedrin in Jerusalem. The cave is still used both for prayer and study, usually on a Shabbat afternoon in summer. Although the gates are normally locked, you can peer through them and imagine that you can see Shem and Ever still bent over their scrolls, studying. If you are lucky you might find the gates open and be able to join a study group, a prayer minyan, or just look around the caves. In front of the cave is a courtyard with stone benches where you can sit and contemplate. Above and surrounding the cave is a lovely rose garden with a few benches where you can picnic or take a rest in the shade. Located just off Palmach Street, by the bridge crossing Jerusalem Street. By car: drive up Palmach from the bus station and just before you get to the Sariya, you will see car parking on your left next to the rose garden. By foot: go up the steps leading from the bridge, and turn left, cross the road and you will see the path leading to the garden and the cave. If you are coming from the Midrahov go up the path by the side of the photo shop, opposite Bank Hapoalim, and then cross the road and walk towards the garden and the municipal information sign.